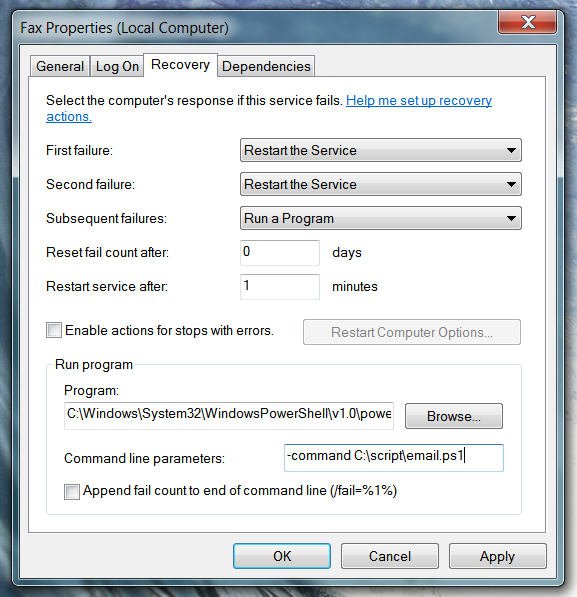 Each Service that runs in Windows features a Recovery tab in the Services.msc management console. Normally I only ever set this up to restart the service after 5 minutes in case something had conflicted with it’s initial start-up attempt. However, we recently had a problem with an IBM service that caused our Windows 2003 R2 x64 server to reboot if it crashed. I thought it would be very handy if we could get an email sent to the IT department if the service was failing. I had dabbled with using BLAT in the past but seeing as all of our servers already have PowerShell installed I thought that would be a more efficient option.